In the case of Tycho's supernova remnant, astronomers have discovered that a reverse shock wave racing inward at Mach 1000 (1000 times the speed of sound) is heating the remnant and causing it to emit X-ray light. "We wouldn't be able to study ancient supernova remnants without a reverse shock to light them up," says Hiroya Yamaguchi, who conducted this research at the Harvard-Smithsonian Center for Astrophysics (CfA). 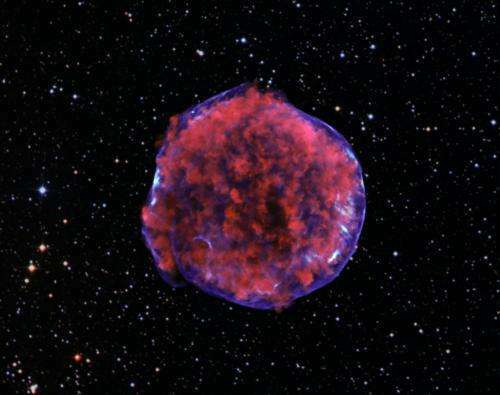 Tycho's supernova was witnessed by astronomer Tycho Brahe in 1572. The appearance of this "new star" stunned those who thought the heavens were constant and unchanging. At its brightest, the supernova rivaled Venus before fading from sight a year later. When that ejecta rammed into surrounding interstellar gas, it created a shock wave - the equivalent of a cosmic "sonic boom." That shock wave continues to move outward today at about Mach 300. The interaction also created a violent "backwash" - a reverse shock wave that speeds inward at Mach 1000. "It's like the wave of brake lights that marches up a line of traffic after a fender-bender on a busy highway," explains CfA co-author Randall Smith. "Thanks to the reverse shock, Tycho's supernova keeps on giving," says Smith. The team studied the X-ray spectrum of Tycho's supernova remnant with the Suzaku spacecraft. They found that electrons crossing the reverse shock wave are rapidly heated by a still-uncertain process. Their observations represent the first clear evidence for such efficient, "collisionless" electron heating at the reverse shock of Tycho's supernova remnant. The process is similar to what lights household fluorescent bulbs, except that the supernova remnant glows in X-rays rather than visible light. The process is similar, an electric current excites the "gas", just as a gas discharge or fluorescent light. No "shock wave" can make plasma glow in this manner. I'm not sure if their use of 'Mach 300' and 'Mach 1000' makes a lot of sense in this context. Mach 1 is the speed of sound in the surrounding medium. The gas cloud around a supernova is pretty thin stuff but is also pretty 'hot', so I have no idea what the 'speed of sound' would be under those conditions, so Mach 1000 is a meaningless phrase without knowing what Mach 1 is. And if they mean '760,000 mph' rather than 'Mach 1000' then they should say so. Sloppy. I expect better from the Smithsonian. No "shock wave" can make plasma glow in this manner. No amount of localized kinetic heating is going to give the observed collective effects. These are decidedly electric plasma processes that lights up this plasma. Rarified interstellar gas does not glow from applying heat, only electrical effects can induce a glow. To be "hot" enough to glow, it is a plasma. There are three well understood modes of plasma, arc, glow, and dark mode. There are well defined parameters that describes these phenomena. Unfortunately ignorance prevails in astrophysicists understanding of plasma. Rarified interstellar gas does not glow from applying heat, only electrical effects can induce a glow. Why wouldn't pumping in energy cause ions to be put into higher energy levels? What you claim is wrong, thermal bremsstrahlung is a well understood process in plasmas which is observed in many many situations. It is a thermal effect caused by heating. "collisionless" electron heating at the reverse shock of Tycho's supernova remnant. If it is collisionless...what is transmitting the "shockwave"? The electron heating is collisionless, they are heating not due to colliding with other particles, they are heating due to oscillating with and in the wave,,,, but the shock wave is the result of the SNR colliding with the ISM. More specifically, what MEDIUM is transmitting the shockwave in which the electrons are oscillating? The ocillating (ya know waving) magnetic fields of the plasma that the electrons are in. Are we going to have a discussion on how a "shockwave" is transmitted without particles colliding now? Only if ya would like to. I'm on the "without collisions between the particles" side. Are saying that there must be collisions to transfer heat? On second thought, let's not. Google up collisionless electron heating, there ya will find a wealth of information to bring ya to speed. Thanks, it's a good paper. New evidence, not so new physics. @tscati - the article says that the outwards flow is at 11,000,000 MPH, and also says that it is Mach 300. Therefore what they are using as Mach 1 is 11,000,000 / 300 MPH = ~36,000 MPH. That is ~50x the speed of sound in our atmosphere, so they are clearly talking about the speed of sound in thin-but-hot gas that surrounds Tycho's supernova remnant. fields must be responsible for the shock"
"Khan....I'm laughing at the superior intellect"
Hey, I didn't write the paper, or have any input on the naming or development of the terminology or jargon in this area, why would ya take your umbrage out on me? This isn't exactly a new area, but the words used to describe it are what they are, there's nothing I can do about that. Ya seem to wish to take offense at the slightest misperception of a person's comment. Why don't ya go rewrite the textbooks that ya are so offended with, I only read them, not created them. There are no "shockwaves" in plasma, there are sheaths and double layers though. DL's and the collisionless electrons are well known plasma processes. Such a notion explains why Q nor mainstream astros don't understand what's going on here, these are plasma processes which they are completely ignorant. You've gone off the deep end now, but I know you won't take that from me. Took me all of 30 seconds to find a paper by Alfven (the later years) where he referred to shock waves. Funny given that you claim they don't exist. There are also many thousands of IEEE plasma physics papers on shocks. I think you should ovoid claims that plasma don't do this and that as going by this time and last you don't know very much about it. "When a star explodes as a supernova, it shines brightly for a few weeks or months before fading away. Yet the material blasted outward from the explosion still glows hundreds or thousands of years later, forming a picturesque supernova remnant. What powers such long-lived brilliance? " Look at any terrestrial explosion, while slightly different, still applies the same physics almost. If you see a grenade or bomb go off, you see the flames lick up and it's the last thing you see. The centre explosion is just a quick flash, and then the outside flames take longer to dissapear. You're propelling the fuel outwards, with massive energies. So guess where you're going to see light/heat through the telescope. The outward moving jets. You're propelling the fuel outwards, with massive energies. What fuel though? The explosion has happened, this is a shock not an explosion. ?? Really? The material blasted from the sun. A sun goes supernova. It basically spits out it's leftover fuel, and flings it everywhere. The energy is moving outwards, from the centre of the sun. The centre, similar to a grenade is going to flash, this is what lasts a few weeks/months, but will burn up the fuel quickly, because most of the matter from that sun will have been jetted too far to be used. The super energetic particles that have just been spat at 3-5% the speed of light will continue to glow due to such energies, which have dispersed from the centre originating part of the supernova. The material blasted from the sun. The conditions to sustain fusion no longer exist. The shock is many, many times less dense than the core of the star. While this material may have fueled the star it will not fuel the shock because it can no longer fuse. In such a tenuous gas the gamma rays would be very detectable. Fact is light is seen, so it stands to reason something is making that light. The star throws out particles, and shockwave energies are obviously exciting these particles enough to give out visible light. So what is the fuel then, back to my original question? There is energy sources is most certainly the shock itself. That's what's causing the light.